Using Bitcoin (BTC) or Ethereum (ETH) to buy alt-coins like TRON (TRX), Stellar (XLM), or Ripple (XRP) can seem intimidating if you're new to cryptocurrency. Though you'll still need to do your research to avoid potential disasters, Binance takes the hassle out of trading digital currencies on your smartphone. Now that it's easier to trade cryptocurrencies, more and more users are getting drawn in to the world of digital currencies. While there's vast potential to make your money grow, it can't be stressed enough how important it is to do your due dilligence and keep track of the latest news for coins you're interested in. That said, we'll cover the process of trading your BTC or ETH for lesser-known alt-coins below. Before you even start trading in cryptocurrencies, we highly recommend you familiarize yourself with Binance and what it has to offer. There's plenty of minor details that you should be aware of, such as overall security, potential taxes that you may be subject to, and fees that they charge for using their services. As far as fees go, Binance basically charges a flat 0.1% fee for executing trades on their exchange, regardless of transaction type. This flat fee is applied automatically once a buy or sell order is fulfilled, and is deducted from the end cryptocurrency. We have a more thorough writeup regarding the fees and other details associated with Binance, so head to the link below to get up to speed. Once you've familiarized yourself with Binance and have decided to take the plunge into cryptocurrency trading, you'll need to deposit either BTC or ETH into the exchange in order to buy alt-coins. This involves withdrawing funds from a BTC or ETH wallet such as Coinbase, then depositing them into their corresponding wallets in the Binance app. The process is fairly straightforward, but if you've never transferred funds into Binance before, head to our full guide on the topic to learn all about it. Both methods come with advantages and disadvantages. For instance, trading via limit orders enables you to buy and sell at prices you deem reasonable, but your orders can take some time to fulfill. Taking the market order route, on the other hand, lets you buy and sell instantly, though the prices can be much higher when buying in, or lower when selling off. Ultimately, it's up to you to decide which method is most ideal as you trade alt-coins in Binance. That said, both methods are pretty simple to execute. To start trading, you'll first need to pick a base currency to buy alt-coins with. Binance offers Bitcoin (BTC), Ethereum (ETH), Binance Coin (BNB), and US Dollar Tether (USDT) as base currencies, though USDT is currently limited to only six cryptocurrencies that you can trade with. For the sake of clarity, I'll refer to the coin you're trading (BTC, ETH, BNB, or USDT) as your "Base Currency" in the steps below. The coin you're acquiring (XRP, XLM, TLX, or numerous others) will be referred to as your "Alt-Coin." 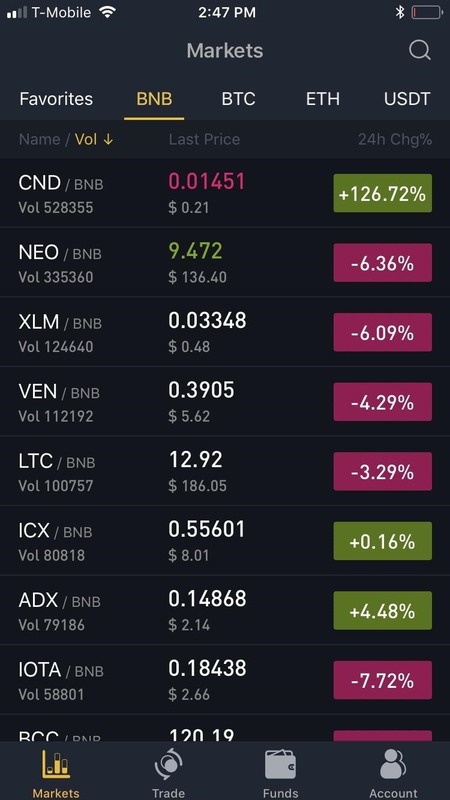 To pick a base currency and commence trading, open the Binance app for Android or iPhone and tap on "Markets" in the bottom-left corner of your screen. From there, choose your base currency by tapping on its corresponding ticker along the top of your screen right below "Markets." We'll use ETH as an example, though the following steps are performed exactly the same way regardless of which base currency and alt-coin you wish to trade. 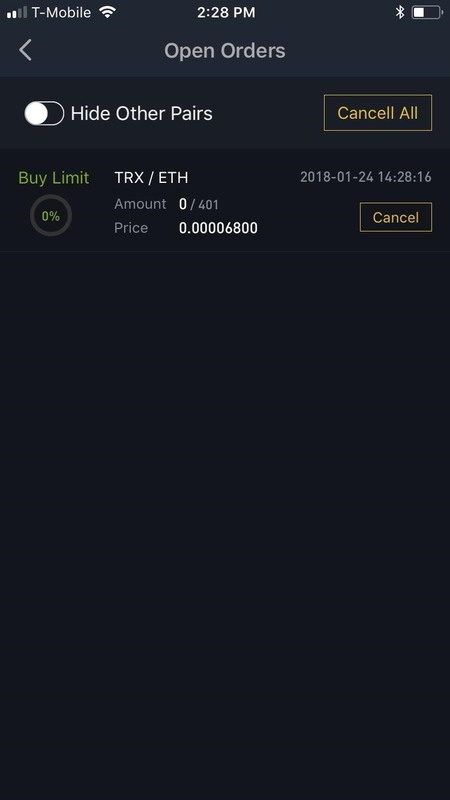 Now, you'll need to choose the alt-coin you'd like to buy — we'll use TRX in this case. 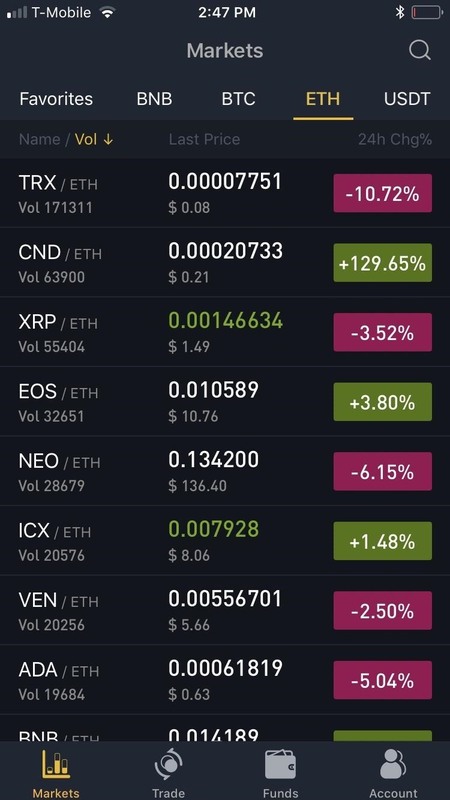 From the list that appears, either scroll down and tap on your desired alt-coin's ticker, or search for its ticker with the magnifying glass icon at the top of the screen. 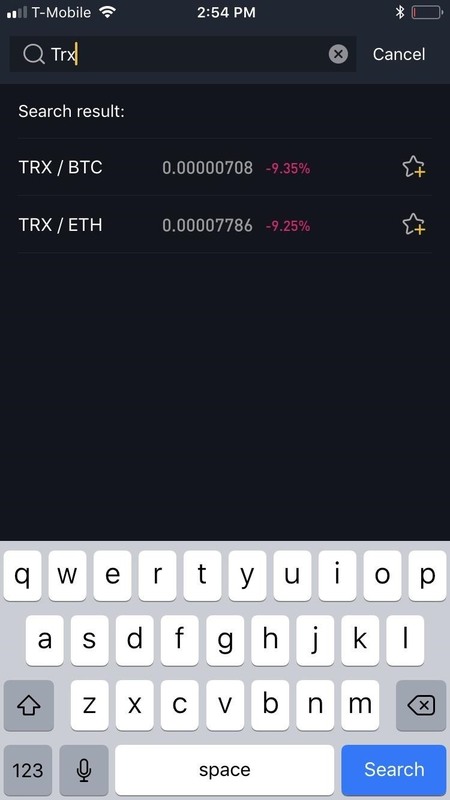 Whichever method you use, tapping on the ticker will open that coin's market page. Due to the sheer number of alt-coins in Binance, we recommend adding your picks from Steps 4 and 5 as favorites to better keep track of their positions. It's pretty easy to do — just go to your target coin's market page and tap the star in the upper-right corner. Head to the link below if you'd like to learn more about this convenient feature. 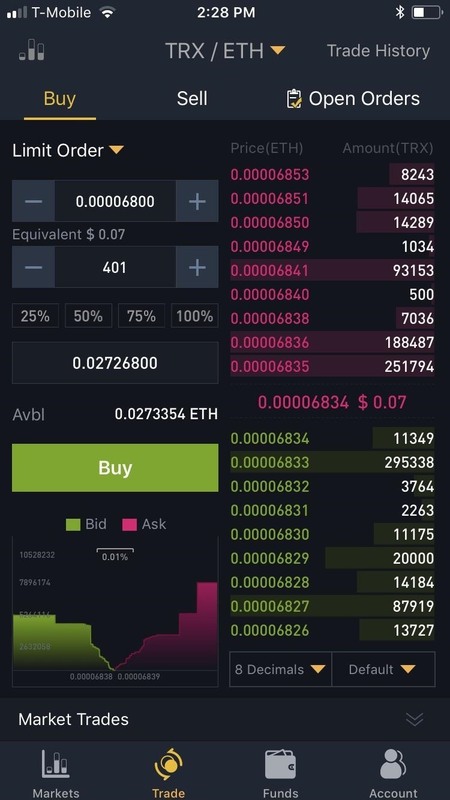 If you're using the limit order method, tap "Order Book" within the market page for your alt-coin, then press the green "Buy" button. Input the the target price you want to buy your alt-coin for, along with the total quantity in the boxes on the upper-left side of the screen. Once you've decided that everything's in order, tap on the green "Buy" button to execute the transaction. 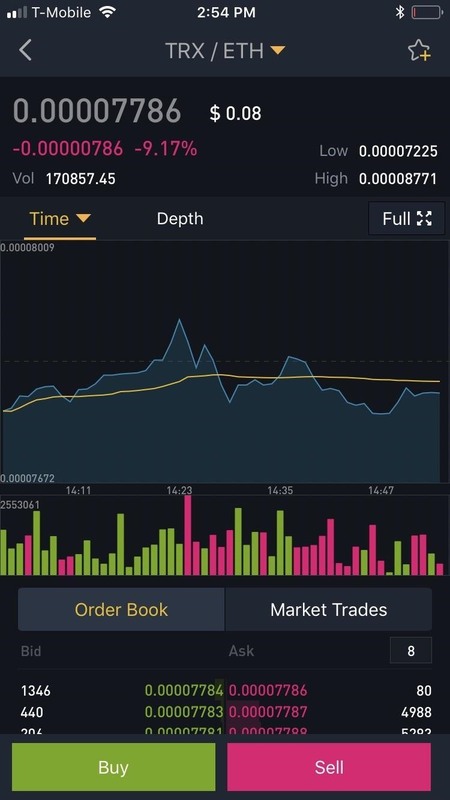 Binance will now place your buy order on its order books, and your alt-coin will be automatically bought either entirely or bit by bit until your order is fulfilled. To keep track of your open buy order, tap on "Open Orders" from within the transaction page for your alt-coin. Buying an alt-coin with the market order method is similar to the limit order method outlined above, but even easier. 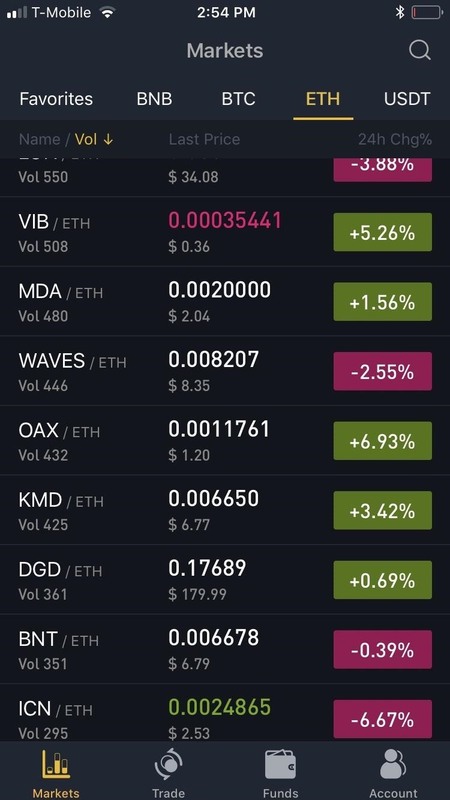 Start by tapping "Market Trades" within the market page for your alt-coin, then press the green "Buy" button. 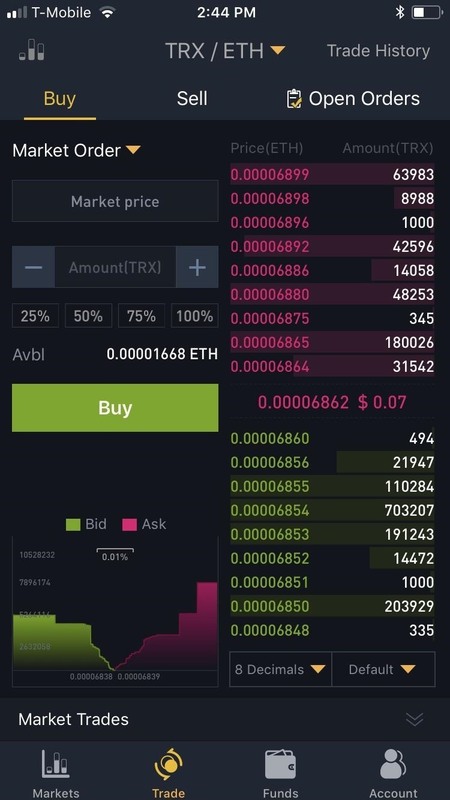 From there, enter your desired quantity, then simply tap the green "Buy" button to execute the transaction, and Binance will instantly convert your base currency to the alt-coin.